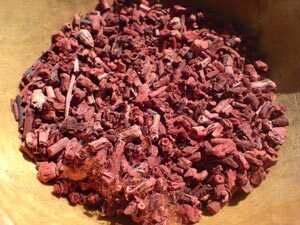 Untill chemical were introduced madder was The most commen source for red dye. It is the root of the plant that gives us the dye. The roots were harvested when the plant was tree years old. the roots were then dried and grinded to a powder. This powder was the basis of the dye. 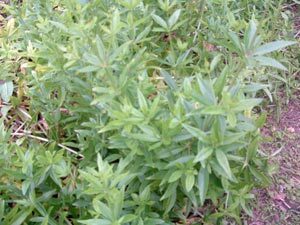 The madder plant is related to cleavers. 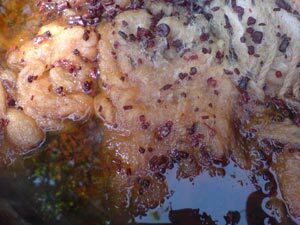 the roots of cleavers can be used to make an orange dye. Both plants have in commen that if you touch the underside of the leafs, it gives a ‘sticky’ sensation that everyone who has ever played with cleavers as a child will recognice. During a anual vikingshow in the Historical Openair Museum Eindhoven we met a very friendly man who was dying woll with madder. (whe forgot his name, sorry). 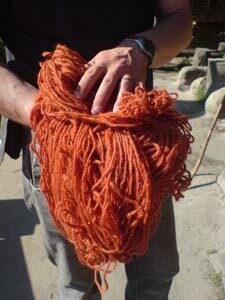 We could use the same dyebath to dye our own wool; Just toss it in.” That is how we got our beautifull dark orange wool. Again Thanks! On the pictures below you can see bits of madder root, on the left before they where used in a dye bath, on the right after use. 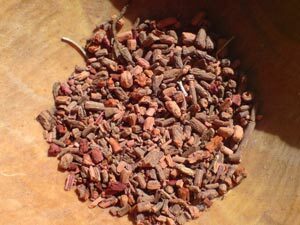 Madder (Rubia tinctorum) is an old crop that came to Europe from Minor-Azië and the Mediterranean. 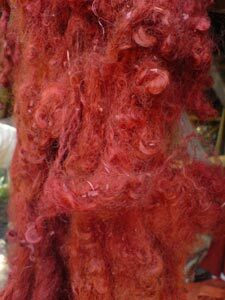 It’s roots hold a red dye that was used to give a red/ orange colour to leather and textiles. As far back as the third century A.D. it was used in Egypt and Greece. 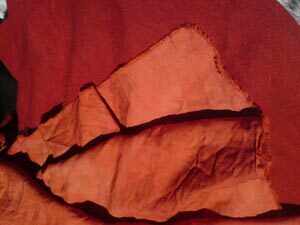 An old piece of Cotton cloth that was found in India and that was dated about 3700 old was also coloured with madder. In mediaeval Europa madder could be found in many gardens. Charlemagne gave orders to plant madder on his estates in his “Capitulare de Villis”. In the 15th century The Netherlands was the prime producer of madder, in the province of Zeeland and especially on Schouwen-Duiveland many madder field could be found. Now madder is mostly grown in India, Turkey and Afghanistan al though some madder is still grown in the Netherlands to this day like in the Betuwe.. For the production of madder dye, the plant is harvested after tree years after wich the roots are dried for at least a year before grinding. 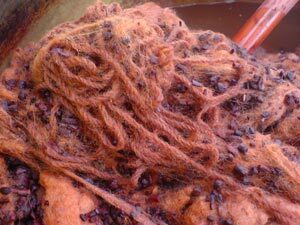 In order to dye 100 gram of wool one needs 25-50 gram madder root powder. 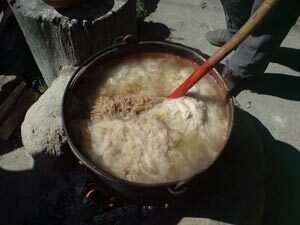 We had just bought a fair amount of wool when we were offered to add it to a kettle filled with madder dye. The same dyebath had been used the day before so this was the second bath. But first the wool needed to be prepared . Preparing the wool makes sure that the wool fibres are open and can absorb the dye as deeply as possible. It will also prevent the colours fading. For this you need water, movement (that means stirring), alum, heat and plants. Those are the main ingredients you need in order to give permanent colour to wool fibres. There are several different products you can use like alum. This will give clear colours. Kaliumbichromate Gives a slight yellow hue. 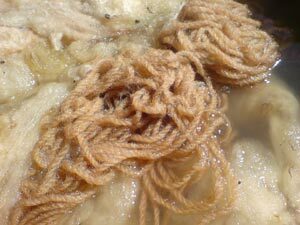 Ironsulfate and coppersulfate can be used after the dying and give the wool a darker hue. 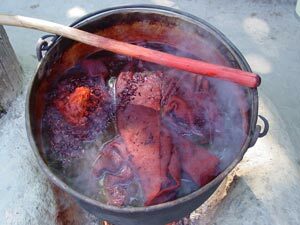 After preparing the wool it is mixed in with the madder dye. The temperature is kept at a steady 90° to get that distinctive red madder colour. Constant stirring is the trick. The temperature is best if kept around 70 °, if the temperature gets higher then that, the colour will be a darker brown. 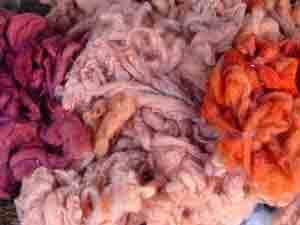 This is the wool that came out of the first dye bath, the day before. The second dye bath will give a red that is much less bright and more orange. These cloths also came out of the first dye bath. 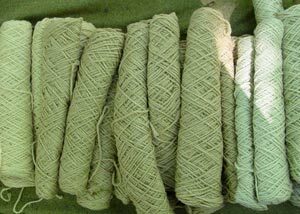 Fifferent materials like linnen and wool will absorbe the dye differently, hance the difference in hue. This is the end result, the orange wool that Ronald and Blue were very happy with. Different colours but al created through the use of madder. Hieronder vindt je de filmpjes die we gemaakt hebben van het verven van de wol. Dan wordt het beitsbad afgegoten. En dan gaat de meekrap erbij. Volg het bord madder van DenBlauwen op Pinterest.